Awesome. I hope this bonus is added to the GAME website soon. Cool, almost no one gets left out 🙂 I have that mini- Sonic Plushie from the Sonic 4 XBLM, So i wonder how its gonna be like: My Super Sonic Avatar holding a miniature version of himself, lol. That would be pretty funny to see. I think the Super Sonic costume combined with the Chaos Emeralds prop would look pretty cool. – Sonic Zone, a hub that resembles either Station Square or the Tropical Resort of Eggman’s Incredible Interstellar Amusement Park, where All Sonic fans can meet! – Chao Garden, where you can raise your own personal Chao. – And a Sonic-Themed home environment for your PS Home Avatar to place his or her furniture, maybe one themed around Eggman’s Headquarters. 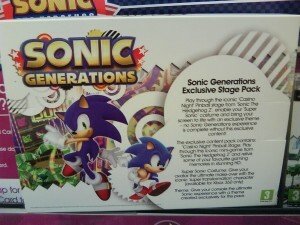 Ok pre-order dlc is cool but come on sega we need a collectors edition please!!!! Truesonic, if it makes you feel any better, you probably would’ve only played the demo only a couple of times, and have done some speed runs too. I play the demo at least once everyday, until it runs out. There were also quite some funny glitches that i found out. I wish Gamestop in Finland will recieve these packs. They did have the pre-order pack of Sonic Colours AT STORE! Yeah. I wish that too. I hope Casino Night is really more than just a “mini-game” , if it isn’t then I hope it’s a damn good mini-game. Or Casinopolis from Sonic Adventure. This is GREAT idea actually! It would be cool if its a pinball/actual level, like you would be able to run around through the pinball level. Does anyone know if you have to be a Xbox Live Gold Member to download Sonic 4: Episode 1? If you’ve ever had internet connection,so you can go online, then you can download it, gold or not. 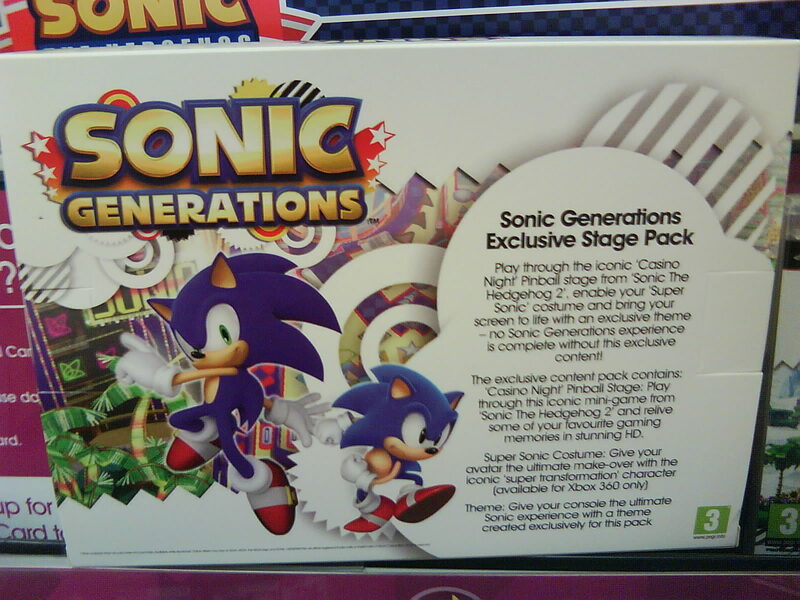 Interestingly enough when I preordered the game at GAME yesterday they told me that they had listings for “Sonic Generations” and “Sonic Generations GAME exclusive edition” of which the guy had no more details on other than their release list said the standard version would be released on the 1st November and the GAME edition would be released on the 11th… Maybe it just means the DLC content or maybe it’s something else entirely. Is this coming to Australia? please say yes!! And if I preordered it before the DLC was announced then do I still get it? Again, PLEASE YES!!! !